The U.S. Olympic team is in the spotlight in Rio, but not for all the right reasons. 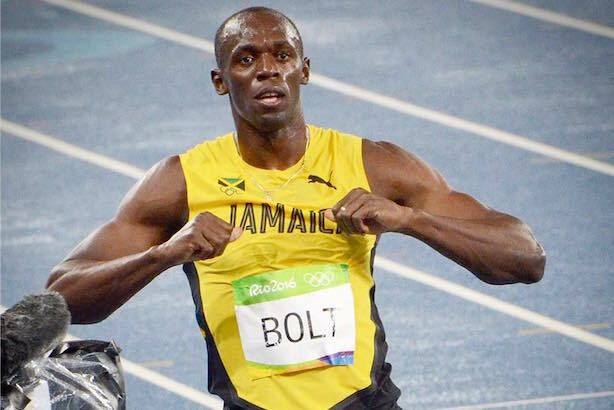 Usain Bolt won the 200 meter gold on Thursday night for the third straight Olympics. (Image via Facebook). ‘Robbery’ of U.S. swimmers overtakes Olympic coverage. U.S. swimmers Gunnar Bentz and Jack Conger left Brazil last night after talking with authorities about a confrontation at a gas station last weekend. Contrary to Ryan Lochte’s statements, police now say no robbery took place. The U.S. Olympic Committee has apologized for the swimmers creating a distraction. Fellow American swimmer James Feign is set to leave the country today after making a $10,800 payment. The controversy could hurt Lochte’s endorsement deals. In actual sports news: Usain Bolt’s record-setting streak continued, easily winning the 200 meter sprint. Ashton Eaton won his second straight Olympic decathlon. And the U.S. and Spanish men’s basketball teams are talking it up on social media before Friday night’s semifinal game. Trump apologizes, but will it last? Donald Trump issued a vague apology for comments that "may have caused personal pain" in a Thursday night speech. The mea culpa came only about 100 days late, according to Politico. The big question: is Trump’s tone change permanent, or will the Republican nominee set off another media firestorm in the coming days with careless comments? Meanwhile, Trump spokesperson Katrina Pierson said on MSNBC that Hillary Clinton could be suffering from a brain dysfunction known as dysphasia. AP connects Manafort to two D.C. firms. An Associated Press investigation has linked Trump campaign chair Paul Manafort, previously working on behalf of Ukraine’s pro-Russian party, and his deputy to Podesta Group and Mercury LLC. Manafort and Rick Gates did not disclose their work as foreign agents, according to the wire service. Manafort was displaced at the top of the Trump campaign’s food chain this week by new campaign CEO Stephen Bannon and campaign manager Kellyanne Conway. Update: Manafort resigned on Friday morning, according to various reports. Clinton tries to cut off foreign payments narrative. Bill Clinton said Thursday that the Clinton Foundation will no longer accept donations from corporations or foreign entities if Hillary Clinton is elected president in November. The former president said he will no longer give paid speeches if his wife is elected, and he has no plans to do so in the next three months. Critics have contended the Democratic candidate’s work at the State Department was influenced by foreign donations. Eddie Bauer discloses hack. The retail chain said its more than 350 stores in the U.S. and Canada have been breached by a malware attack that could leave customer information up for grabs. It said its systems were infected between January and July of this year.